1. Heat a dry frying pan, and toast the almonds for a couple of minutes. Turn out into a bowl. 2. Dot the butter into the pan and add the sugar, cinnamon and 2 tablespoons water. Heat gently, stirring for a few minutes until the mixture starts to look syrupy. 3. Add the plums and dried fruit, and cook gently for about 5 minutes, stirring occasionally, until the plums have softened slightly but still hold their shape. 4. 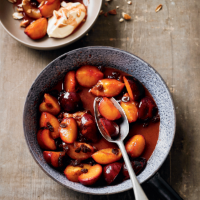 Divide the plums among serving bowls, scatter with the almonds and serve with crème fraîche.